Tactile experiences are so important for young children. For toddlers, it's primarily about the sensory input of exploring different materials. They get plenty of chances to touch wood, fabrics, and plastics. Exploring the textures of nature is also important. Rough bark, smooth stones, cool leaves. Powdery dry sand, grainy wet sand. Garden soil, squishy mud, clean water. Drinking water from a glass is a different sensory experience than nursing with mama skin to skin. Hiding seashells in piles of sand feels different on the hands than squelching mud between bare toes and then rinsing it off with cold water from the hose. As children reach preschool and kindergarten age, their hands want to do more than just explore and experience, they also want to create. They want to mold materials with their hands, to shape, compress, stretch, smooth, pat, squeeze and pound. The sensory experience is still important, but the impulse to model is stronger. Young children need modeling mediums they can use to practice creating, feed their imaginative play, and develop the sensitive and precise sensorimotor system of the hands. Makes one cup – we usually do this times five for a nice big batch. Heat the water, salt and cream of tartar in a large pot over low heat. When it's warm, add oil and flour and keep stirring. Cook until the mixture dries out and pulls away from the side of the pan. If it's sticky, try heating and stirring a bit longer. Turn the dough out on the counter and knead while it's still warm. This is the most delightful part! Add coloring if you want. Store the playdough in airtight containers (we re-use quart-size yogurt containers for this) at room temperature. It lasts a long time. We keep a box of tools handy for playing with as well: Cookie cutters, kid-safe knives, popsicle sticks, stamps and various things for making impressions, rolling pins. 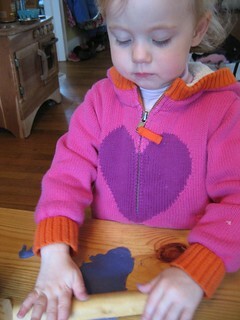 We made our own playdough tools by using drawer pulls for stamps and sanded dowels for rolling pins. They were a big hit!